So here is my oral submission to Council, this morning. I’m going to speak to two issues today – the first one of which relates strongly to relationships. Relationships with mana whenua are incredibly important to me, and should be to everyone – I would expect that they should be important enough to be in the largely publicised discussion document on the Long Term Plan and I was disappointed that they weren’t. It’s my belief that this is indicative of a flaw in the value of the mana whenua relationship, and the first issue that I’m going to address today will further illustrate that flaw. I note that $700k over 10 years has been allocated for the Waingake Waterworks Bush Restoration. Whilst I support the explicit focus of this very important area it is my belief that this is nowhere near the amount required to reduce the threats and implement a sound restoration strategy. The very beautiful Waingake Bush, surrounding the Arai River. I appreciate the response from council on this issue which notified the budget for this work was based upon the restoration needs of this area identified by the Wildlands Report of 2003. The available Wildlands report does not include the options and associated costs so I have no way of knowing if the cost estimate is as outdated as the restoration requirements – however the fact that the foundational document is over a decade old further underlines my concerns that the initial amount allocated for this project is grossly underestimated. 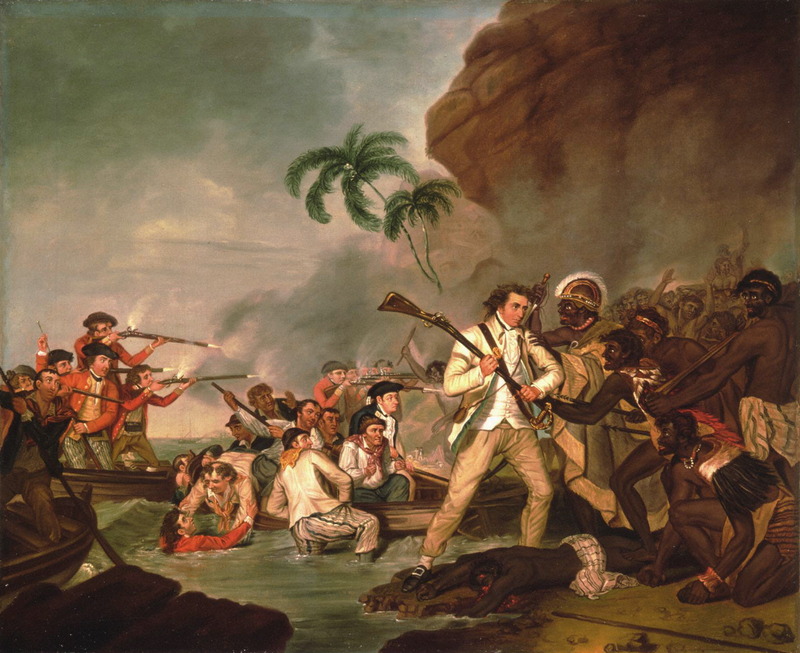 As stated in my written submission – I find the council expenditure of $2.6million towards the celebration of Captain Cook’s arrival here to be perverse given that in his first 36 hours he managed to murder 5 local Maori, wound a further four and kidnap 3 – this was not uncommon practice across the Pacific for Cook, and in fact was eventually the underlying cause of his demise in Kealakeakua Bay in Hawai’i. 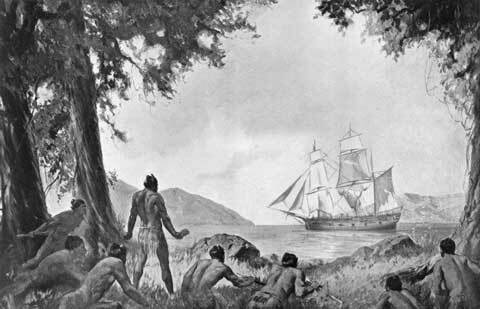 What I had not written in my submission was that a number of those killed in Cook’s first visit to Turanganuiakiwa were actually from Orakaiapu, on the banks of the Arai River, and were Rongowhakaata. So can you see, how the allocation of $700k for the headwaters of the Arai River is not only underestimated but also incredibly inappropriate in comparison to the $2.6million commemoration of a date that resulted in the murder, maiming and kidnapping of Rongowhakaata ancestors. That you would give so much so celebrate this event is nothing short of a whitewash and historical amnesia. 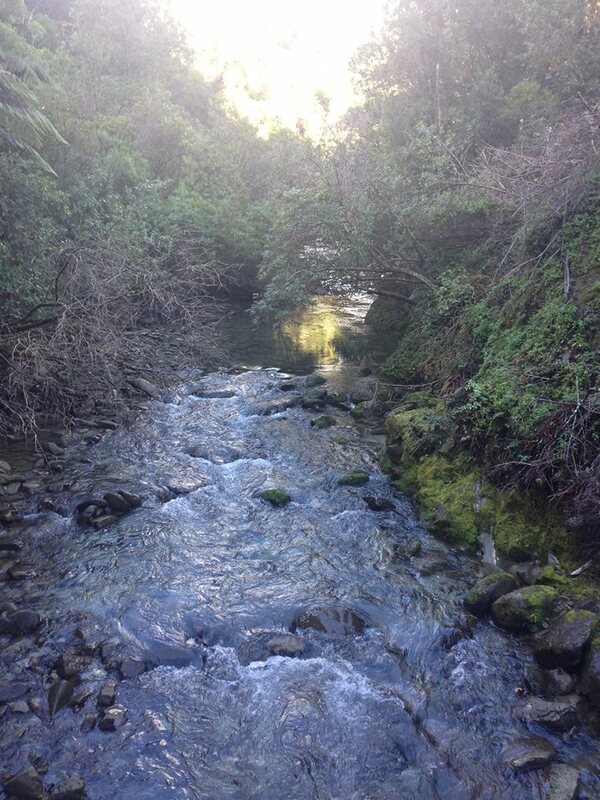 I note that previous documents have only referenced Ngai Tamanuhiri as the relevant iwi, and wish to point out that while this may be the case for the headwaters, the majority of the Arai River runs through the heartlands of Rongowhakaata and is their sacred waterway. I appreciate that Rongowhakaata representatives are envisioned to be included in the advisory group, along with local Manutuke and Waingake representatives. Holding a position on an advisory group that sits alongside other community interests presents potential for mana whenua voices to be subsumed and belies the fact that as treaty partners, mana whenua hold distinct powers that should go over and above an advisory capacity that sits equal with all others. By including all of the relevant sections of the Council in engagement processes we will support co-designed and co-located projects and processes. I therefore wish to submit, in light of council’s intention to include mana whenua in an advisory capacity, that the Waingake Waterworks Restoration Project be a co-designed project between the mana whenua of the Arai River and GDC. I wish to further note issues related to Gisborne’s waste management. Every year, New Zealanders use 1.14 billion petroleum based plastic bags. On average a plastic bag has 20minutes of use. However, they can take anything up to 1000 years to break down in the environment. As a pacific country, and coastal community we are also direct contributors to the extreme levels of plastic pollution in the Pacific Ocean, which is rapidly becoming acidified by plastic waste, and is killing fish, marine mammals, and birds at alarming rates. The World Wide Fund for Nature has estimated that over 100,000 whales, seals, and turtles die every year as a result of eating or being trapped by plastic bags. I appreciate feedback from council which seems to communicate that according to the council’s annual litter survey – plastic waste and plastic bag litter is, relatively, not an issue in Gisborne, and is best addressed through educating people into using reusable bags. Well, I have been carrying out my own research, on a weekly basis, for over a year now. The rubbish I wheeled into council chambers. This took me all of 20minutes to pick up from Kaiti Beach, on the way here – you cannot tell me we do not have a problem with plastic waste on the beach. Since the beginning of last year, I have been divesting myself of plastic waste and taken an active interest in monitoring plastic waste in the Gisborne region, particularly on our beaches. To hear that the GDC has been actively educating people to refuse plastic bags comes as an absolute surprise to me because I have never once come across any sign, or person, who has communicated this message on behalf of the GDC. Most retailers still use plastic bags and do not ask. We have two major supermarkets, one of which uses plastic bags as a default the other which has plastic bags at the point of sale, with boxes a small walk away – and both of which have recyclable bags – however in my own observation surveys I have personally noted that the majority of users still rely on plastic bags. If, as the GDC response suggests, plastic bags are not a problem in our landfill, and they are not a problem in the annual GDC litter surveys – then WHERE are they going? Because we’re certainly consuming them. Furthermore, in relation to the litter surveys, I understand that they are largely conducted on street sites, not on beaches, which is where the majority of littered plastic bags wind up. They don’t stay on the street waiting to be picked up. 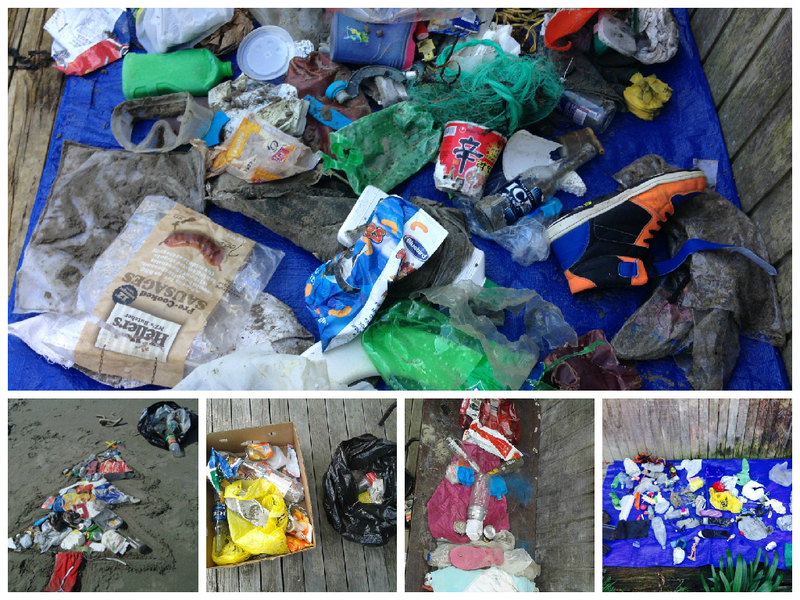 The slides of rubbish that I have been picking up from the beach over this past year, which I presented to Council. 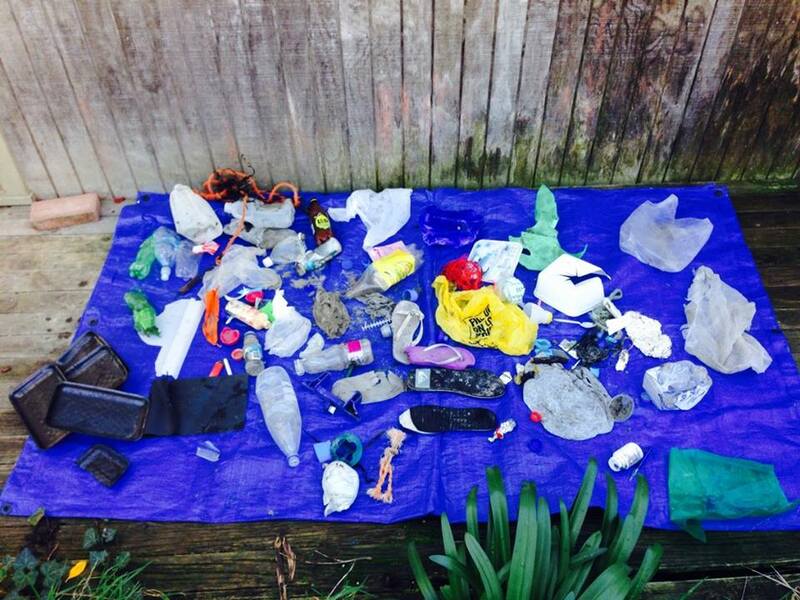 I KNOW that we have an issue with plastic bag waste because I have been down the beaches, picking the rubbish up and I can tell you that we DO have a plastic litter problem and there ARE a lot of plastic bags on the beach. As opposed to your annual litter survey – I carry out a weekly litter survey when I walk my dogs on the beach and pick up the plastic litter, bring it home, sort it, wash it, weigh it and recycle it. In a 20min walk on the beach I will average 5-6kg of plastic waste that I pick up. I have been weighing it since August last year and measuring the plastic that I pick up against the plastic waste that I create in order to understand my plastic waste footprint. As you can see – there are plastic bags here every single time, including PaknSave bags. Globally, and nationally – plastic bags ARE an issue, this is not an opinion it is a fact – and our plastic waste does not just remain in our region either – it becomes the issue of other regions, it becomes an ecological issue that affects our ocean which we all have a stake in. Plastic bag consumption also fosters unsustainable behaviour because they are made from petroleum and in fact a car can drive 11meters on the petroleum required to make one plastic bag. PLASTIC BAGS ARE CREATED FROM NON-RENEWABLE RESOURCES, THEY ARE UNSUSTAINABLE IN THEIR PRODUCTION, AND IN THEIR DEGRADATION. THERE IS NO SUCH THING AS AN ACCEPTABLE LEVEL OF PLASTIC BAG POLLUTION. In short – the responsible answer is NOT to merely manage them as a waste issue but to manage them as a consumption issue, and turn the problem off AT THE TAP. They are an icon for unsustainable behaviour – so if we are to entertain any hope of having a sustainable future, plastic-bags cannot feature. Bans come in many different forms and need not be immediate, absolute, or overly punitive – there are a range of approaches ranging from a ban on the sale of lightweight bags, charge customers for lightweight bags or generate taxes from the stores who sell them. Major countries such as Rwanda, China, Eritrea,Taiwan and Macedonia have a total ban on the bag. In the United States there are 187 jurisdictions that have banned plastic bags, including two states (California and Hawaii) – in multiple jurisdictions across over 40 countries, plastic bag bans of one kind or another are being implemented. Here in Aotearoa Waiheke Island and Kaikoura have both committed to going plastic bag free, and weeks ago, Auckland Council’s Environment, Climate Change and Natural Heritage Committee unanimously moved to “Support making Auckland plastic bag free”. GLOBALLY – PLASTIC BAG CONSUMPTION IS CONSIDERED THE HALLMARK OF UNSUSTAINABLE BEHAVIOUR. It is therefore my continued submission that GDC support a journey towards a plastic bag ban for Gisborne region. This is a journey that can certainly be supported through proactive education, but must be with the explicit goal of divesting ourselves of lightweight single use plastic bags and thereby modelling responsible, sustainable behaviour. I urge GDC to commit to reducing our plastic bag consumption through working with communities and business owners on a journey towards developing our own bylaw that will gradually restrict plastic bag use, and eventually ban them completely. It’s been a while! The one year mark came and went and yes… I made no fanfare (well, not on here but if you’re on my facebook page you would have seen the post). I guess because it has, very much, become a lifelong journey for me. So Jan the 1st 2015 was very much like Dec 31 2014, and all of the days of that year beforehand. 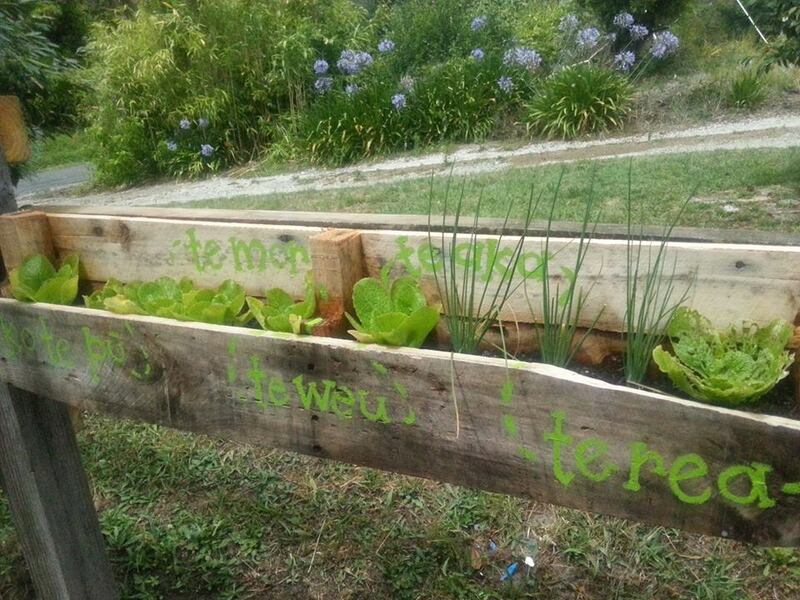 But still… can’t wait til I can grow my own cabbage, broccoli, kumara etc. My average waste collection on my daily walk down the beach was 5.4kg. 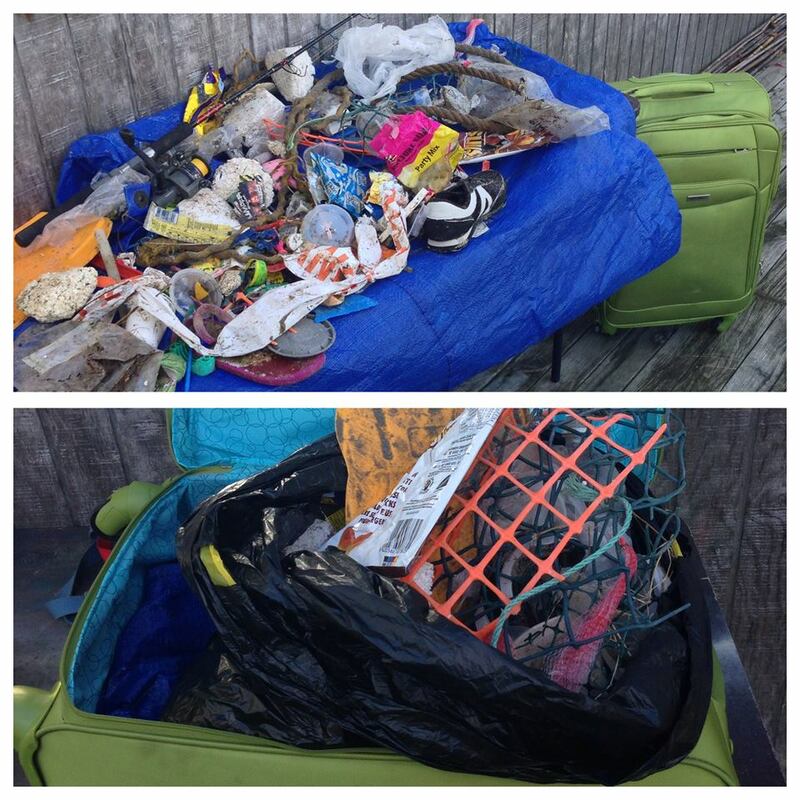 20mins of plastic collection down our local beach in Gisborne. The biggest barrier? Well – for me personally – I found that travel, and sharing your living space, came with plastic. It’s MUCH easier to control your plastic waste when you’re at home, by yourself, with a schedule, rather than out and about. My response to that? Well – preparedness and open communication, really. You have to be clear and open about what is ok to bring into the house. 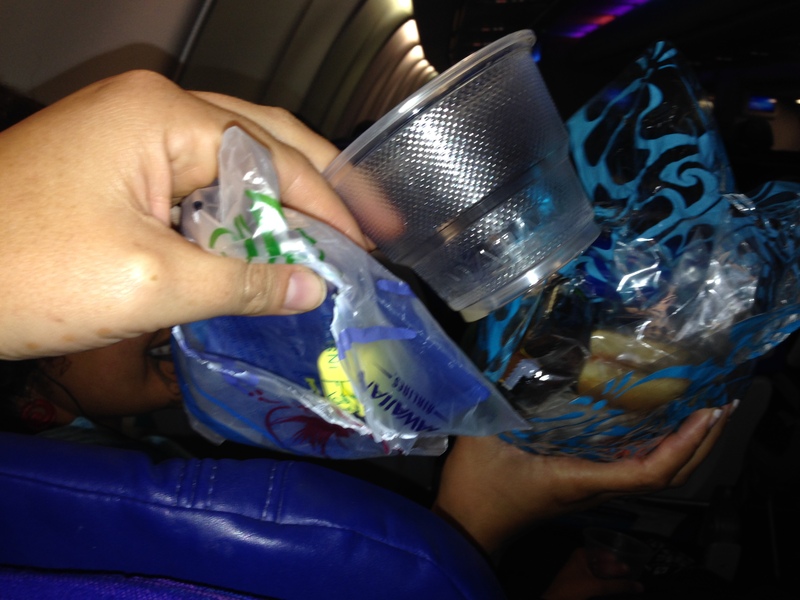 Airplanes – plastic, inside plastic, wrapped in plastic, in a convenient plastic pouch. My highlight of the year would be…. Plastic free July – and participating in the “Buy one get one tree” campaign that our local cafe’s took part in. That was massive. Getting to go to Nagoya to support the cause of sustainability at the UNESCO Conference for Education on Sustainable Development (ESD) was also incredible – and the many, many marvellous people I’ve met while on my journey to become plastic free – hearing that they have felt inspired to take that path themselves has been a continual source of motivation for me. So for everyone who stopped along the way to say hi, who sent a letter of support or let me know that it’s inspired them to go plastic free, themselves – THANKYOU, thankyou so much. Author Tina NgataPosted on May 18, 2015 May 18, 2015 Categories UncategorizedLeave a comment on CONSUMPTION COUNTS!